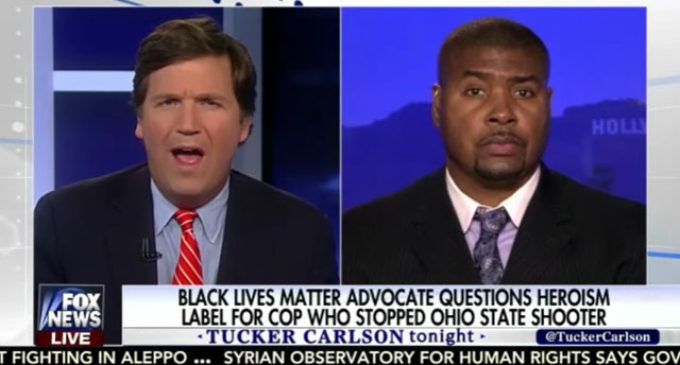 Tariq Nasheed, a self described “anti-racism strategist,” alleged that Ohio State University Police Officer Alan Horujko was only being praised because he was white and the suspect, Abdul Razak Ali Artan, was black. Nasheed attempted to back up his theory by pointing to a shooting incident last month in Boston in which he claimed no officers were labeled as heroes. As one Twitter user quickly pointed out, the officers actually were. Artan was a Sunni Muslim lashing out against the oppression of the U.S., according to some of his Facebook posts. Islamic State has since called the man a “Brother” touting his terrorist attack as a positive strike. “What are you saying?” Carlson asked at one point about the assertion. “I’m sorry, there’s only so much I can take,” Carlson said. “I’m not even going to rise to the bait,” Carlson replied.